Roger Brown is one of Norway’s leading headhunters – someone who finds top-level appointees for companies when openings arise; we quickly learn via Roger’s interview of a possible “headhuntee”, Jeremais Lander, that the reasons for his success are due to his adoption of FBI interrogation techniques and the way in which he double-bluffs his clients and his targets to up the commission he receives for his efforts. Readers new to Nesbø need to pay close attention to the questions Roger asks Lander. Roger is married to Diana, a beautiful woman whom he met while both were students in London. He’s totally in love with his wife, who runs an exclusive art gallery in Oslo’s “best” street for the purpose; the couple live in a very expensive house with all the right brand names in the kitchen and every possible designer accessory to luxurious modern living. Roger’s brilliance at his work – he is said never to have been unsuccessful at persuading a client to hire the candidate he has chosen – covers up his various insecurities about the strength of his wife’s love for him if he does not indulge or anticipate her every whim; his sensitivity about his height; and his unhappy relationship with his father, a chauffeur in the diplomatic service. The bottom line for Roger is that he’s, if not broke, in that state of juggling his credit-card borrowing to maintain his self-created image and avoid facing the prospect of the inevitable crash as his debts mount up and he spends more and more on his wife – a need related to Roger’s guilt at pressuring her to have an abortion, as he does not want to have children. Roger’s imaginative way of keeping afloat financially is a clever one, yet it is one that plunges him into bleak despair when he makes a shocking discovery. Before he can even react to his find, let alone decide what to do about it, he’s immediately plunged into yet another crisis that requires drastic measures. Every action Roger takes, however sensible it may seem to him and, it has to be admitted, to the reader (this is not one of those books in which one is mentally yelling at the dumb protagonist to take some elementary precaution), makes everything worse, escalating to a degree where it seems impossible to imagine how he can escape by the skin of his teeth to enter the next fire or frying pan. The author is simply amazing at pushing the pace forward, as Roger is not only a victim of the circumstances he finds himself in owing to his greed and others’ deviousness, but also to survive he has to struggle to regain the upper hand in the game of bluff that has been his life, and at which he had thought himself to be a supremely talented player. There are only a few characters in the novel, yet the twists and turns of the plot are both breathtaking and clever, leaving me in delicious confusion about who was fooling who, and who was going to come out on top, as the author turns the tables repeatedly on his readers as well as his characters. If you’ve read Nesbø’s earlier novels, you’ll know that the author likes to puncture his narratives with inventively gruesome and horrific scenes, often laced with black humour. Brace yourself on this front if you read Headhunters! This is not a novel for animal lovers or for those of a sensitive disposition. For me, the “over the top” scenes work well in Headhunters (unlike the Harry Hole novels) because they are so integral to the plot, both in explaining what was previously mysterious and in driving events forward. The most extreme of these scenes concerns the most disgusting hiding place of all time – which also means that Roger has to witness a truly revolting but funny event – yet not only is this perfectly acceptable in the context of the novel, but both the hiding place and the horrible observation turn out later to consist of several crucial plot elements. Similarly, Roger’s method of escape from another of his apparently hopeless situations is nastily gory but strangely acceptable. 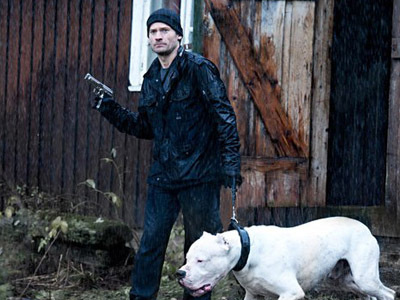 Headhunters has several obvious differences from Nesbø’s usual style. It is written (mainly) in the first person, so Roger’s thoughts and feelings are directly experienced by the reader, and one feels plunged into the story as a participant rather than observing it from outside, as one does in the Harry Hole books. Headhunters is shorter, funnier and lighter than the Hole series, written in a much more pacy, thriller style. Nevertheless, the books have in common the fantastic complexity of plot at which Nesbø excels. If you really do pay attention to every word, you might be able to work it all out, because this author is not one who cheats his readers (though there was one small but pivotal point which I thought would not have worked as described). You’ll have to read the book to find out whether Roger manages to stay ahead of the game or not, and whether he is doomed or redeemed. It’s a fizzling, clever story, never letting up on its imaginative twists both small and large, yet by creating a three-dimensional character in Roger, with his past and present insecurities, the reader is embedded for the duration – aided by the impeccable translation of Don Bartlett. And I should not forget to mention that there’s lots of local atmosphere, incidental yet telling details of milieu, and fascinating “windows” into the snob values of Oslo in particular and Norway in general. Headhunters is “soon to be a major motion picture” according to the book’s cover (images in this review are from the film). 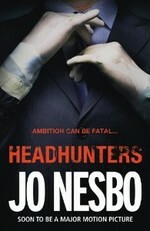 From the author’s website: “The film adaptation of Jo Nesbø’s novel Headhunters premiered in Oslo on Friday [29 August 2011]. 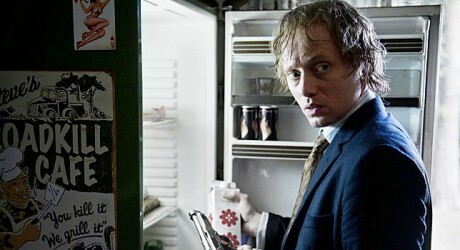 Even before the opening, the film had become the most widely exported Norwegian movie in history. The film will be screened on every continent.” See Scandinavian movies for a trailer and more details about the film. Jo Nesbø at Euro Crime (reviews of all the Harry Hole books so far translated and essential for the correct reading order) and Wikipedia. About Harry Hole at the author’s website (with blurb of each of the books, including of those not yet translated). Great review Maxine. Unfortunately I didn’t enjoy the book as much as the Harry Hole series. I thought the relationship between husband and wife unrealistic and the mechanics of the art theft that Roger Brown commits too simplistic. Firends of mine however have loved the book though so it will be interesting to hear what other people think! I think these are fair points, Sarah. I was prepared to let myself be carried along with it, but there were definitely other less than realistic aspects (eg the hair gel). Maxine – Superb review as ever! I wasn’t sure I was going to read this one, but it really does sound marvellous. Such a fascinating portrait of a character! I have to admit that, being an animal lover, I thought a few times as I read your caveat. But Nesbø has yet to really disappoint me. Maybe I’ll put this one on my list. I think my problem was that I didn´t care about Roger Brown. Well, they can´t all be Harry, and if the book had been written by anyone else, I might have enjoyed it more. I don’t think Roger at all likeable, Dorte, and I didn’t care about him either – an anathema to me – but was fascinated to see what was going to happen to him next. I think this is one of those books you either make up your mind to like, or not – I didn’t have any expectations of it (as I am ambivalent about the Harry Hole books), but was pleasantly surprised by how much fun it was. Dorte, sorry that my internet search seems not to have revealed your review, I’ll look again and add a link. That is just what happens when I review Scandinavian books because I use the Danish title 🙂 And I can´t complain as I am not very good at adding links to other reviews these days. Reading Operation Napoleon by Arnaldur Indridason. I’m helpless before tales relating to World War II. Know what you mean, Bernadette – and this particular one lacks the “heavy” aspects of the Harry Hole books, which are sometimes a bit too long for their plot/content, I think (though on the whole I do like them). I was not sure about reading this book, but this review pushed me along to thinking I’ll probably read it. The animal cruelty and gore gets to me, but I’ll try it and if I have to, I’ll skip some parts, which I did even with the Stieg Larsson books. I’ve read two books by Jo Nesbo, and thought Nemesis one of the best thrillers I have read, in the intricate plotting, constant twists and turns, and challenges to the reader. And, yes, you’re right: Nesbo does not cheat the reader. So I will give this one a chance. I think this is a book that polarises readers. Some like you have loved it, others like me couldn’t relate to Roger and couldn’t suspend disbelief enough to enjoy it at all. I’d be curious to see the movie to see if the actor can make Roger more of a likeable character for me. And there are certainly very graphic scenes that I’m curious to see how the director deals with them!!! Sounds like I’d better not see the film! It probably isn’t so extreme, just reading about it. I found the S. Larsson trilogy more brutal in film version. Had to walk out of the room or turn away on occasion. While reading, I just skimmed or skipped a paragraph here and there. But on-screen, some of those scenes were just more brutal, especially in the first film and the end of the second one. It was just so graphic. I agree, Kathy, graphic violence is usually something film makers are keen on (in Tinker Tailor Soldier Spy remake, you could not call the violence that graphic, but they added violent scenes eg someone getting shot in the head and someone murdered in a bath in gruesome anatomical detail, that weren’t in the book or the original TV version). This kind of violence is easier to skip over in a book. Books can be much more upsetting than films, though, in terms of depth of tragedy of plots – films are almost always more superficial and portraying the inner depths of a novel. In a book, one reads and thinks about something. It is not up posted in technicolor in front of your nose, a few feet away, and then tense music, people with horror-stricken faces of fear. One’s adrenalin zooms which usually does not while reading. I think pacemakers and defibullators should be installed at every movie theatre. Libraries don’t need them (except for sick or elderly people anyway). I think I can deal with this book, and probably the movie, though I need to read the book first. What concerns me is that I want to read Unity Dow’s book, but when I read about what happens to the girl, I want to get on the first plane to Saskatchawan and leave the book behind, and just look at lakes and beautiful elk and moose.